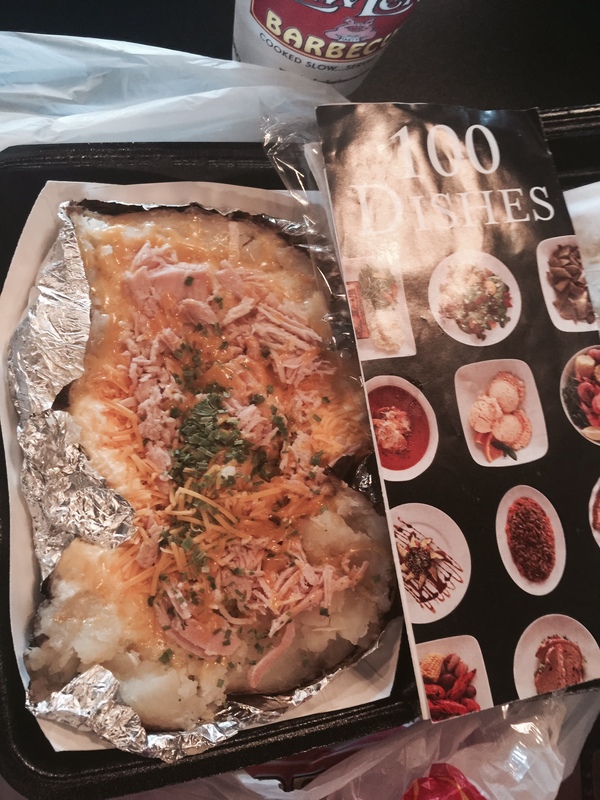 These “Stuffies” Have Major Tatertude”-Lawler’s- Meg’s #17 Stop on 100 Dishes To Eat In Alabama Before You Die. Tasty Tuesday- MEGabite #17 or 84 on the countdown. If you drive I-65 near Athens in North Alabama, and see the large billboard sign for Lawler’s; PULL OFF AND GET THIS STUFFIE! Having never heard of Lawler’s, I had no expectations on the restaurant or this dish. I had expected to stop, take a taste, try boring stuffed potato, take a photo and cross this off my list. Let me tell you, I was so pleasantly surprised that I left nearly laughing/giddy because I loved it that much! I had to call other people to debrief. You may order your potato with ham, pork, turkey, 2-meats or no meats. I love turkey. My first look and then taste were both a thrilling shock. First off, the size of this MEGatater; where do they even grow these potatoes? Next, the taste was SO out there delicious. I think what makes this dish stand out is quality ingredients; delicious hand-pulled, slow smoked turkey, good butter, good cheese and sour cream, blended perfectly and sprinkled with chives. I am a Lawler’s convert. This stuffie was outstanding and will linger in my memory of great Alabama food. Lawler’s in Athens was immaculate and featured really nice décor. Music was playing while I ate, literally. There are televisions in the restaurant. The order was uber fast, Before doing this write-up, I notice that there are other locations. I also noticed that my reaction was one that many other customers have had. Not only has this dish been chosen for “The 100 Dishes,” it is on on the “North Alabama Barbecue Trail” and has testimonials from a professional chef. 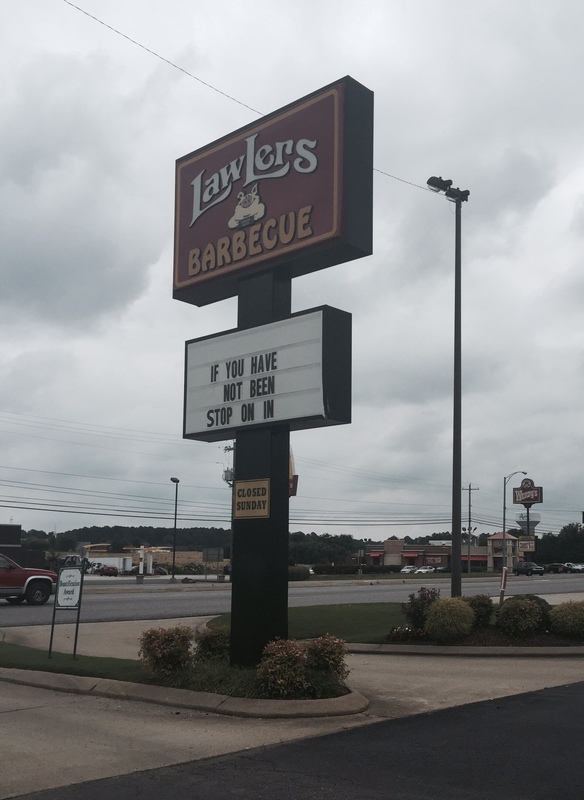 Lawler’s website speaks to their mission, which is to be your BBQ place. Faster, cleaner and tastier. Lawler’s you are the real deal. Thank you for this magnificent dish. 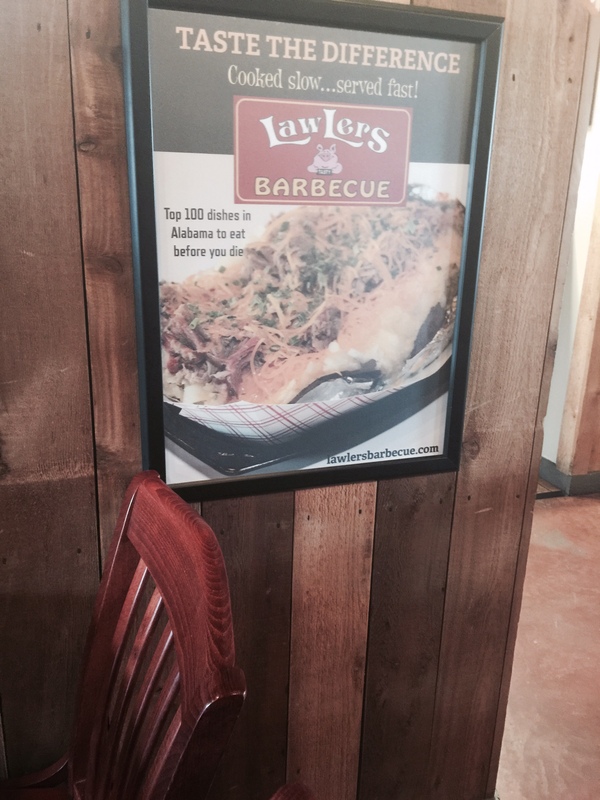 Lawler’s , an easy 5 of 5 MEGastars * wonderful, clean, friendly and inviting environment. **** for an extremely delicious dish using the criteria set forth by Alabama/Foods Tourism, local foods served with Alabama pride. The Athens location has a drive thru. 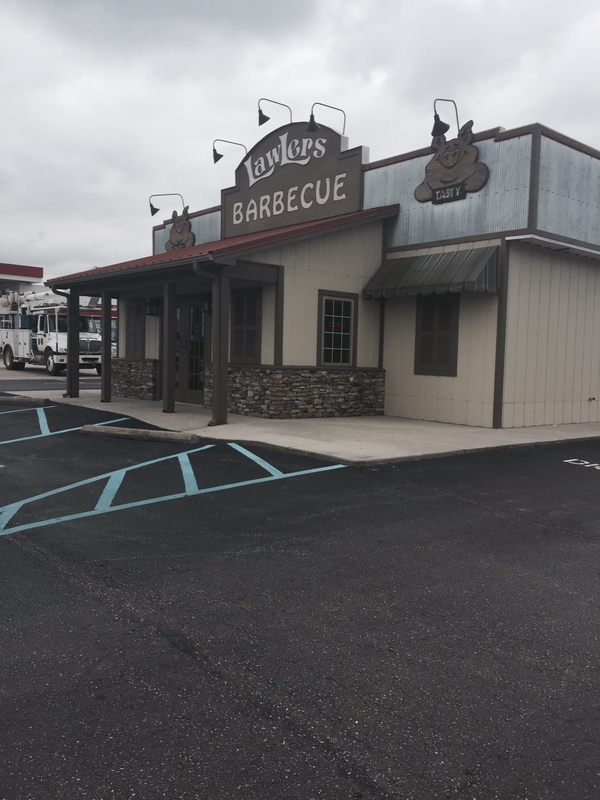 But, if you drive I-65 as often as I do, know that this nice clean, friendly, fast establishment with fantastic food is a very easy stop. You will be in and out just as quickly had you stopped at a nearby and boring fast food place. Get that Stuffie. Yes, I imagine it has nearly my daily intake of calories and maybe sodium. You won’t need another meal for the day. I ate half then and half later. I could have eaten it at one sitting and had a hard time not doing so. MEGayum!